Early years children do not change in appearance as quickly and drastically as they did when they were babies and toddlers. Boys and girls are usually similar in size and body shape during these years. Your child's size will depend on many different characteristics and if you have any concerns you should speak to your health care provider. Your child is still building and learning how to use both large and small muscles in her body. It is a great idea to do regular family activities that encourage these muscles to grow. Walking the dog, playing soccer, or swimming are only a few of the activities that will get your child's body moving while also learning the importance of being physically active. It may also provide the perfect opportunity to speak to your child about her day. Your child will continue to become more smooth, balanced and fluid when doing physical activity. You may have noticed a large difference in how your child threw a ball at four-years-of-age compared to his abilities at seven. 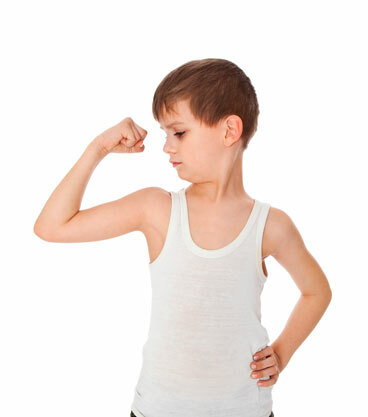 This is because your child is gaining more muscle strength and is no longer top-heavy. As your child gets older, his centre of gravity shifts to his torso which will make some activities easier to perform, such as kicking and ice-skating. Physical activity is important to many aspects of child health and development. Childhood obesity is a serious concern for Manitobans. The harmful effects of carrying excess weight are not only physical but social and emotional as well. Children who are obese are more likely to feel badly about their bodies and themselves and are more likely to be teased by school mates. Parents should monitor the types and amounts of foods their children are eating. It's important to remember that your children are watching what you eat, so encourage everyone in the family to eat a variety of healthy foods. Learn about the risk factors involved with childhood obesity and how to help your child maintain a healthy weight. Follow this link to information about eating well with Canada's Food Guide. The Winnipeg Regional Health Authority offers a number of nutrition resources to groups and organizations.